Look Who's Talking. Tristar Pictures 1989. I never had much interest in this movie, but it caught my attention. It does have some big names in it, but lots of duds do too. I always thought it wasn’t very good mostly on the basis of the fact that it has two incredibly derivative sequels, but I guess that’s a compliment really. The only unfavorable opinion I’ve seen of it is a contemporary MAD parody, but it’s in some way their job to criticize everything. 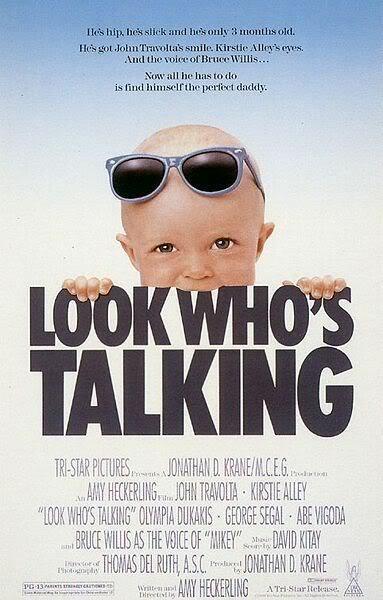 Looking more closely at it, the film does look like it has the potential to be more focused on being sweet and silly, rather than an obnoxious talking baby gets up to mischief farce like I always imagined it being. Mollie is very practical in what she wants in a husband, which is why she’s waiting for her accounting client the successful businessman to divorce his wife for her. She gets pregnant, and is still waiting for him. Nine months later, she makes the shocking discovery that he’s having another affair. Her argument with him puts her into labor, and she meets James, an astoundingly sensitive taxi driver, who sticks around even after his fare is paid and he returns the purse she left in his car. He wants to help her and her son Mikey, but he also wants to use her apartment to fake residency for his grandfather so he can move him to a nicer retirement home. This is how James becomes Mikey’s babysitter. Mollie is determined to find a good father for Mikey, but none of the men she dates are good choices, and although James is getting closer to both Mollie and Mikey, she can only see the worst of him. Also Bruce Willis performs Mikey’s inner monologue. The draw of this movie is supposed to be Mikey’s role, but he could be just as mute as the other characters hear him and it wouldn’t impact the plot at all. It’s a charming gimmick, but the real point of the film is Mollie’s experience being a new mother, and of course the reluctant romance between her and James. I’d even go so far as to say the Mollie and James plot is just there to give the story of a new mother somewhere to go. That’s not to say that I don’t appreciate these extra trappings. A movie is more than just its plot. Mikey’s lines are terrific, and are so well informed by baby behavior as to suggest to me that as much as I enjoyed it now, I’d find it even more perfect if I were a parent. It’s a romantic comedy, so of course all of the relationships have to be painfully obvious to everyone except the protagonist. You know in two lines that the businessman father is a sleazeball. You know, by the hospital if not sooner, that any woman with James in her life has received a magnificent gift from a higher power (the Writer). At least Mikey, who is of course not able to express this to anybody, knows immediately that James is the man he and Mollie need. This is yet another example of a mis-sold movie. With all the focus on the baby, I wasn’t expecting such a unique, well-written romantic comedy. Even the blurbs for it foster misconception, suggesting that Mikey conspires to get Mollie and James together. Sure, he wants to tell his mother that James should be his dad, but he just does regular baby things, and almost everything that convinces Mollie comes from James’s behavior, as it should. Watch this movie: as an example of what to expect after you’re expecting. Don’t watch this movie: as an example of what to expect when you’re looking.